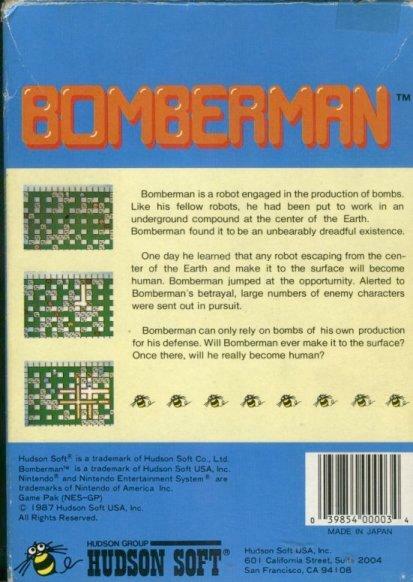 Bomberman is a robot engaged in the production of bombs. Like his fellow robots, he had been put to work in an underground compound by evil forces. Bomberman found it to be an unbearably dreary existence. One day, he heard an encouraging rumor. According to the rumor, any robot that could escape the underground compound and make it to the surface could become human. Bomberman leaped at the opportunity, but escape proved to be no small task. Alerted to Bomberman's betrayal, large numbers of the enemy set out in pursuit. Bomberman can rely only on bombs of his own production for his defense. Will he ever make it up to the surface? Once there, will he really become human? A humble beginning for our little hero. The only objective on the agenda is blowing up all the enemies, finding the exit and repeating. And sometimes a bonus stage. That's it. There's no in-game storyline; there's no colourful locales; there's no bosses... there's not even any multi-player! 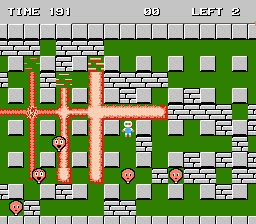 Despite the minimal content and wobbly controls, popular consensus in Japan seems to label this game as one of the best (sometimes the best) Bomberman game in the series. It continues to be homaged and referenced in even the newest games, and the basic formula has been remade far too many times. Meanwhile, most English fans see an old, primitive game and are left thinking, "what's all the fuss about?" The story and ending of this game ties into Lode Runner, another Hudson product. 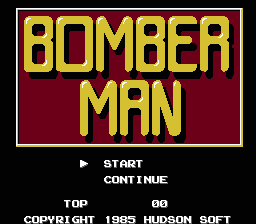 Although not exactly a Bomberman game, it's included on the site for completism regarding the series' history (and for shits and giggles). 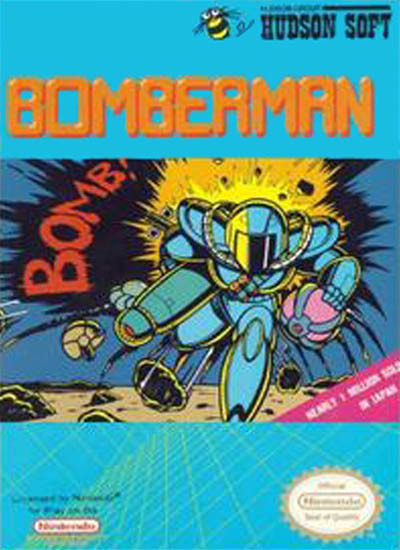 Although rarely acknowledged, the very first Bomberman game was actually... Bomberman, on the MSX and other computers. This game has had a few rereleases. Check out the pages for Hudson Best Collection Volume 1 and Bomberman (PSX), and the Famicom Mini section.